RAMCO engineers and manufacturers part washing systems using modern water based detergents and preferred alternative solvents to replace hazardous chemicals and toxic solvents. 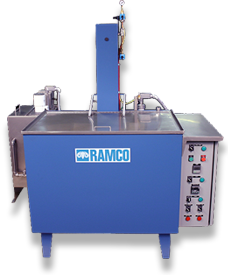 RAMCO’s parts washing systems and parts washing systems are designed to meet a wide variety of applications from simple to demanding cleanliness, cell washing to final precision cleaning. Their innovative designs and features facilitate rapid cleaning of simple as well as complex parts allowing us to achieve results that other systems cannot.